What Do Data Scientists Do? 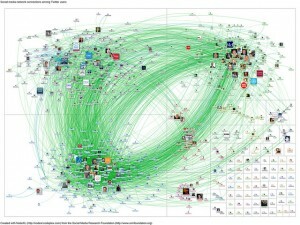 An example of big data visualization showing social media network connections among Twitter users. Created by Marc Smith used under Creative Commons License. In the competitive world of data science, a master’s degree is a requirement for advanced positions at top companies. The online UW Master of Science in Data Science is a smart choice for busy adults who want to advance their careers—or start a whole new career—but don’t have time for on-campus courses. 12 courses. 36 credits. Online. Affordable. This data science master’s program will teach you how to harness the power of big data using the latest tools and analytical methods. Courses are taught by diverse and distinguished faculty from across the University of Wisconsin System. Tuition for the program is a flat fee $842 per credit for summer 2019 and $850 for fall 2019 whether you live in Wisconsin or out of state, and financial aid is available for students who qualify. Because the program is entirely online, you can study and do homework whenever you like, wherever you have an Internet connection. Courses have no set meeting times and you never need to come to campus. An innovative Virtual Lab lets you remotely access software tools and programming languages such as R, Python, SQL Server, and Tableau, saving you the cost, time, and hassle of purchasing and installing these applications on your own computer. At the same time, you will have ready access to success coaches and faculty by phone and email, and you may take advantage of on-campus resources such as career assistance and libraries. Upon graduation, you will be well prepared to solve problems and seize opportunities in organizations public and private, in virtually any industry: health care, computer science, information technology, retail, marketing, manufacturing, transportation, communication, education, insurance, finance, science, security, law enforcement, and more. Aptitude tests such as the GMAT and GRE are not required for admission. You may be eligible for admission to this program if you have completed a bachelor’s degree with a 3.0 or better grade point average (GPA) and prerequisite courses in elementary statistics, computer programming, and database administration. (Students with a GPA of less than 3.0 may be considered for a provisional admission.) Ideal candidates will have a background in math, statistics, analytics, computer science, or marketing, or three to five years of professional experience in a related field. Not sure if you meet these requirements? Call 1-877-UW-LEARN (895-3276) or email learn@uwex.edu to discuss your options. Students must satisfy all prerequisites before starting program coursework. Students will not be allowed to take outstanding prerequisite courses concurrently with introductory program courses. Program academic directors have the option to waive one or more of the above prerequisites based, in part, on student work experience and background. If you are not sure whether you meet these requirements, call 1-877-895-3276 or email learn@uwex.edu to discuss your options. The UW Master of Science in Data Science program is approved by the University of Wisconsin Board of Regents and approved by the Higher Learning Commission. The UW Master of Science in Data Science is a collaboration of the University of Wisconsin Extended Campus and six University of Wisconsin institutions: UW-Eau Claire, UW-Green Bay, UW-La Crosse, UW-Oshkosh, UW-Stevens Point, and UW-Superior, bringing you the best and brightest data science instructors from across the UW System. Although you will take courses taught by faculty from all six partner campuses and complete your program entirely online, you will be asked to apply to a “home” campus. Your home campus is the institution from which you will receive financial aid (if you qualify), advising, career services, and ultimately, your diploma. Enrollment advisers are available Monday through Thursday 8 a.m. to 7:30 p.m., Fridays 8 a.m. to 4:30 p.m. CT, or by appointment. 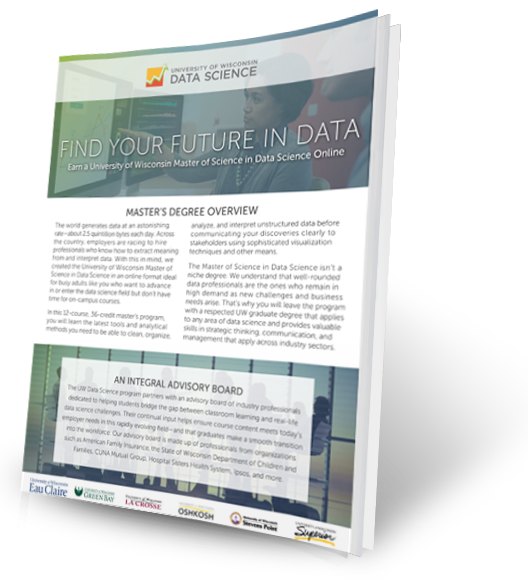 Download a four-page overview of the UW Master of Science in Data Science, complete with information about courses, careers, and tuition. Data science is a rapidly growing field encompassing multiple major areas of interest including analytics, big data, and data mining. Analytics professionals with relevant experience or prior training are finding that a degree in data science provides them with the knowledge and skills necessary for a career in big data analytics. The University of Wisconsin online data science degree is designed to help fill this skills gap, while positioning data analytics professionals for a fulfilling career in data science.